Lee Li Lian of the opposition Workers’ Party won the Punggol East by-election by a comfortable margin Saturday, delivering a big blow to the ruling People’s Action Party. The 34-year-old sales trainer garnered 16,038 votes against PAP candidate Dr Koh Poh Koon’s 12,856 to become the first female opposition member to win a single member constituency since 1965. Reform Party’s Kenneth Jeyaretnam received 353 votes while Singapore Democratic Alliance’s Desmond Lim garnered just 168 votes. A total of 29,832 votes were cast, of which 417 were rejected votes. But more than just the win, it was the margin of victory of nearly 11 per cent between Lee and Dr Koh that surprised many. After polls had closed at 8pm and ballot boxes had been delivered from polling stations to the counting centre at North Vista Secondary School, word soon began to trickle that WP was edging the contest by a narrow margin. Right up until the official announcement made by Returning Officer Yam Ah Mee shortly before 11pm, the margin of victory was expected to be close. 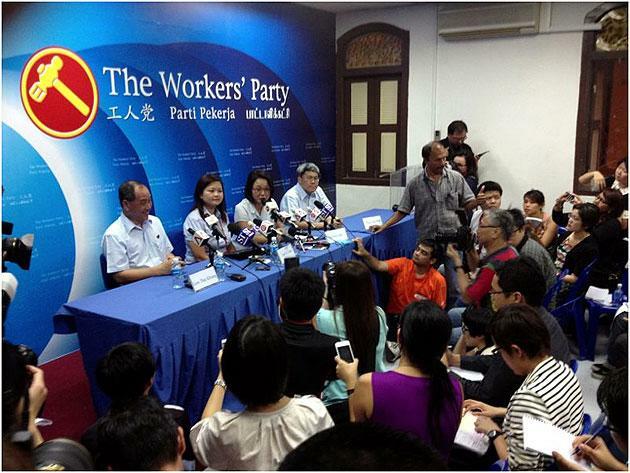 During a press briefing at the party's headquarters at Syed Alwi Road, WP's Lee thanked voters for their confidence in her and said her top priority would be ensuring a smooth handover. She promised to manage the estate diligently and "stand up for you when you need to be heard", immediately sharing that her Meet-the-People sessions would start on 4 February, a sign perhaps that she and the party had come fully prepared, expecting to win. WP chairman Sylvia LIm noted that the impact of the campaign had the ruling party scrambling in the eleventh hour and showed "the value of political competition in getting the government to sit up and take notice". However, she said WP remained a small party and there was still much to do and improve upon, dismissing the notion Singapore was close to being a "two-party system" when over 90 percent of Parliament was still in PAP hands. She added that the party would continue to engage the government on issues close to Singaporeans but said she hoped that Lee's victory would encourage more women to join politics. WP secretary-general Low Thia Khiang said the results of the by-election show Singaporeans still expect the government to work harder. "The results show that the effect (of new government policies responding to citizens' concerns) has not really trickled down on the ground," he said, noting that there were still a lot of pressures in the area of cost of living. "I expect the government will work harder on that and the Workers' Party will assist whenever it can," he said. In a statement, Prime Minister Lee Hsien Loong said he respected the choice of Punggol East voters, and congratulated the WP for its victory. He added that the PAP fielded a good candidate in Koh, whom he said showed character and courage in contesting the election. In a press conference after the results were announced, Deputy Prime Minister Teo Chee Hean, with candidate Koh beside him, said the government would continue with programmes for the long-term good of Singaporeans. DPM Teo singled out the "circumstances leading to the by-election" as well as issues like the stalled construction at Rivervale Plaze as being central to the PAP's defeat. "I hope the voters can give us their support the next time," Teo said. Koh, meanwhile, thanked all those who helped them in the campaign and said he would be ready to serve if called upon by the party. SDA's Lim, who conceded defeat before the election results were officially announced, said it had been a "fast and hard" race, and that entering the content he was well aware of the risks and challenges. Lim, who was criticised for joining the race and perhaps diluting opposition votes, said the move was something the SDA had to do to keep its political flame alive. The by-election, which came after then Parliament Speaker and MP for Punggol East Michael Palmer resigned last month in disgrace after admitting to an extra-marital affair, was closely watched by Singaporeans . The win brings to seven the number of MP seats held by the WP, aside from the two places garnered for NCMPs. One more NCMP seat is held by Lina Chiam of the Singapore People's Party. She has been with the party for six years and has held various posts including president of the youth wing and is its current deputy webmaster. Lee has campaigned on the promise she would fight to make the voices of worried young parents raising children heard, as well as those elderly Singaporeans facing rising costs and medical care. Lee said she would fight tirelessly to make the voices of worried young parents raising children heard if elected to Parliament, as well as elderly Singaporeans facing rising costs of medical care.